Group Discussion Ideas > Current Affairs GD Topics > Can ‘One Belt One Road’ improve developing world? OBOR executes infrastructure projects in those connected countries and also improves trade among countries. In the medieval period, there was a silk route from China to other countries, which was used to trade silk. Now, China is reviving this silk road and named it as OBOR. ‘One Belt’ is land route formed by OBOR, called as ‘Silk Road Economic Belt‘. 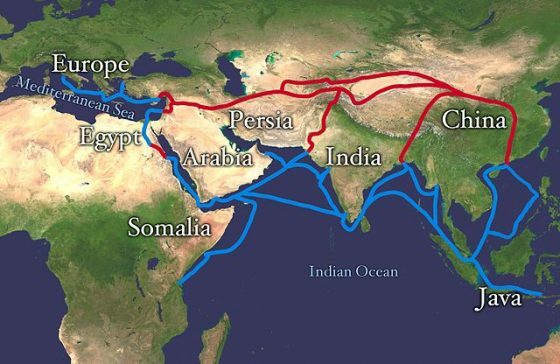 ‘One Road’ is ‘Maritime silk Road‘ formed by ocean route. Infrastructure projects will be executed on a large scale in the countries that are included in OBOR. China is assuring peace in West Asia as a result of improved economy and job opportunities. China promised to transfer its knowledge in agriculture, water conservation and engineering to the developing countries. Through OBOR, immense job opportunities will be created in the connected countries for local people. China claims that OBOR will speedup globalization and helps in keeping the world united. Critics argue that OBOR is started to sell the Chinese products to the developing countries. As a result of decreased exports, many manufactured products are piled up in China. If OBOR is successful, China may emerge as a superpower and can control developing countries. This may lead to neo-colonialism. China may focus only on profit and may not care the local developmental needs in the countries. In African infrastructure projects, China recruited Chinese people and thus didn’t create jobs for local people. If this process is repeated in all the projects associated with OBOR, developing countries will be at loss. China may monopolize the valuable mineral reserves in the connected countries. For example, Afghanistan has copper, iron, gold and silver reserves. Many of the countries that are included in OBOR have political instability and corruption. With these loopholes, there are chances that the projects may fail. Earlier Chinese investments in Srilanka and Myanmar failed. Developing countries may get trapped in the huge debts that are provided by China for the infrastructure products. The concept of OBOR is good. But the way of its implementation will reveal the true intentions of OBOR. As long as the sovereignty of the countries is protected, healthy cooperation among countries will yield positive results.